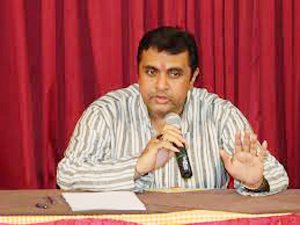 Udupi, June 19, 2015: Speaking at a meeting held to review applications received for houses in Udupi Assembly constituency, MLA Pramodh Madhwaraj stressed on the need for transparency in processing and shortlisting the list of the homeless people. The MLA said priority would be given to those who stay in rented homes without own land. He said applications without appropriate documents would be ignored. The document verification should get over by another week. He said all processing and shortlisting of names of applicants should be decided before June 30 and the list sent to PDOs for further verification. He said names of beneficiaries should be identified and simultaneously land for the purpose of distribution should be identified. Only 50 per cent of identified land would be given away to beneficiaries and remaining land would be reserved for the future. . Calling for immediate completion of the entire process, he said the list should be scrutinised and reverified for final approval, which should be done by July 30. He said first list of around 1,400 applications would be final by August and second list which would have 1,020 applications would be scrutinised by August 30 in Udupi CMC limits. Asserting that applications should have specific guidelines for processing, the MLA said additional applicants should be put under B list which would be considered only when there is additional leftover land mass. He said there is no deadline for aspirants to submit applications, however, administration would decide upon sanctioning the house. He said as many as 3,072 applications are received in rural areas that come under Udupi Assembly constituency. He directed officials to immediately process the applications received in the process of road widening. Officials said 36 applications are under consideration received following national highway widening, Malpe-Vadabanadeshwara Road widening, and Vishnumurthy temple road widening in the Doddannagudde area, he added. The official said land is also identified in Herga, Doddannagudde and Nyampanahalli. As many as 1.12 acres and 12.5 acres of land is identified separately in Herga. The list would be finalised by July. The MLA said people who have given land to widen the stretch should be given priority. He said migratory workers who reside in the tent near Brahmavar Sugar factory should be given temporary shelter, as their habitat is in danger. The tent houses are very close to national highway, which may lead to accidents. He directed officials to embark upon the idea of involving private parties which would result in public private partnership to provide houses for homeless needy, he said.